From the Frontlines web-a-thon will broadcast live over the internet on Thursday. The event is a joint project of Melanie Morgan’s Move America Forward, UStream.TV, and Hot Air. Michelle Malkin and Melanie Morgan will host this historic internet event. 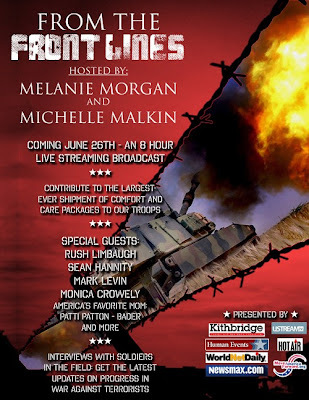 On June 26, from 4pm Eastern/1pm Pacific to 12midnight Eastern/9pm Pacific, Melanie and I will be anchoring a livestreamed, 8-hour fund-raising “web-a-thon” to send the largest number of care packages to our troops overseas in U.S. history. We’ve got a star-studded line-up participating in this effort to support our military, including Rush Limbaugh, Sean Hannity, Mark Levin, Laura Ingraham, Dr Laura Schlessinger, Ollie North, Monica Crowley, Ann Coulter, Nancy Reagan, actor Kelsey Grammer, and Five for Fighting’s John Ondrasik. You’ll be able to tune it at Hot Air and on UStream, embed the broadcast on your own blogs, and even catch some of the show on your radio dial if you’re lucky to be in the listening area of a radio station partner. Wow! What a fantastic line-up of patriotic Americans! What a great idea for our troops. I plan on posting the videostream here at Gateway Pundit tomorrow. You can sponsor a care package for the troops by clicking here. Move America Forward has more on the event today Here. And, Michelle Malkin has more information posted.